According to whatbird.com, a group of geese has many collective nouns, including a “blizzard”, “chevron”, “knot”, “plump”, and “string” of geese. We often see large blizzards of snow geese here over the winter, but they’ve been gone for several weeks now. Snow geese migrate north for the summer and breed in the Arctic regions of North America and eastern Siberia. I can’t help but wonder how our little surprise visitor was left behind. No matter now. I’m sure her friendly Canadian cousins will take care of her until she’s reunited with her snow goose family. 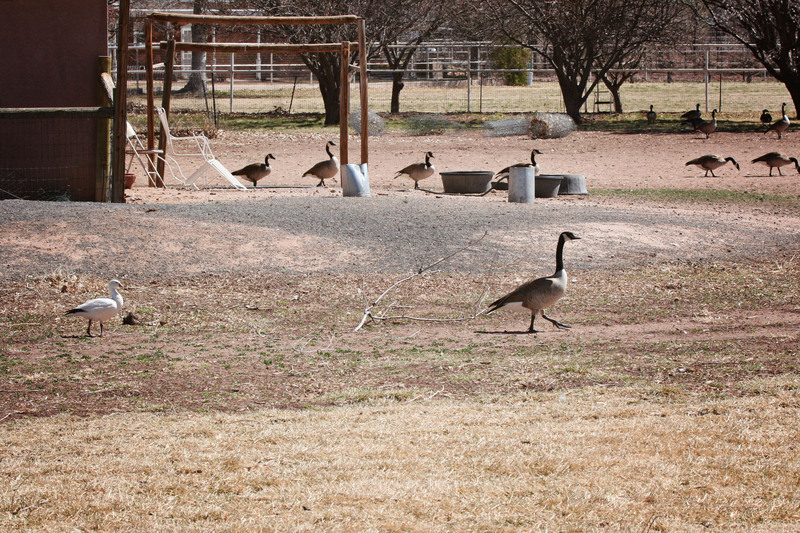 3/1/13 update: Our surprise visitor wasn’t a snow goose, but rather a Ross’s Goose. http://identify.whatbird.com/obj/293/_/Rosss_Goose.aspx. Thank you, Patrick C! Wow. I thought snow geese were as big as Canada geese! But I’ve never seen one . . . except in that movie, years ago. Yes, what a great surprise to have a visit of beautiful snow goose at Morning Bray Farm! 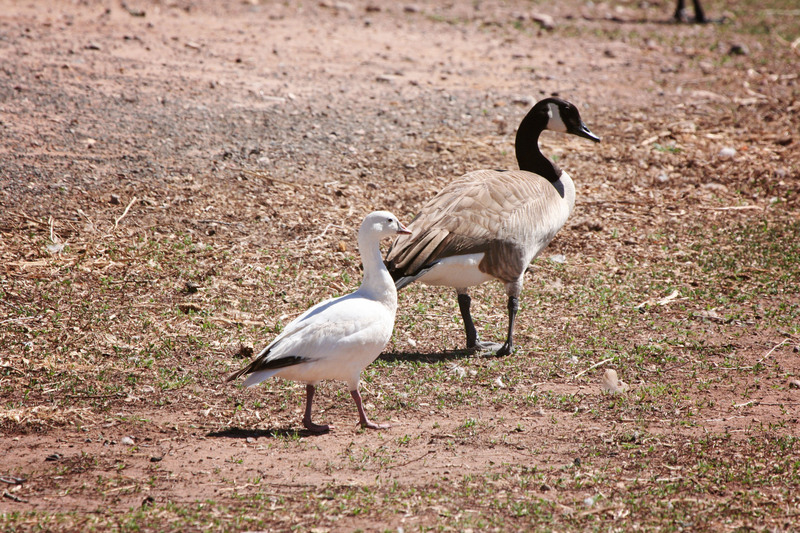 Looks that snow goose and Canada geese be friends. 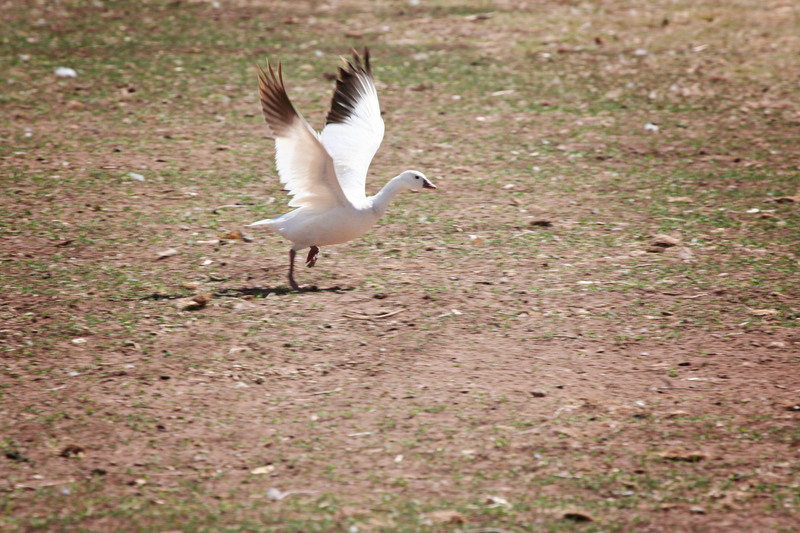 Yes, what a great surprise to have a snow goose visiting Morning Bray Farm! 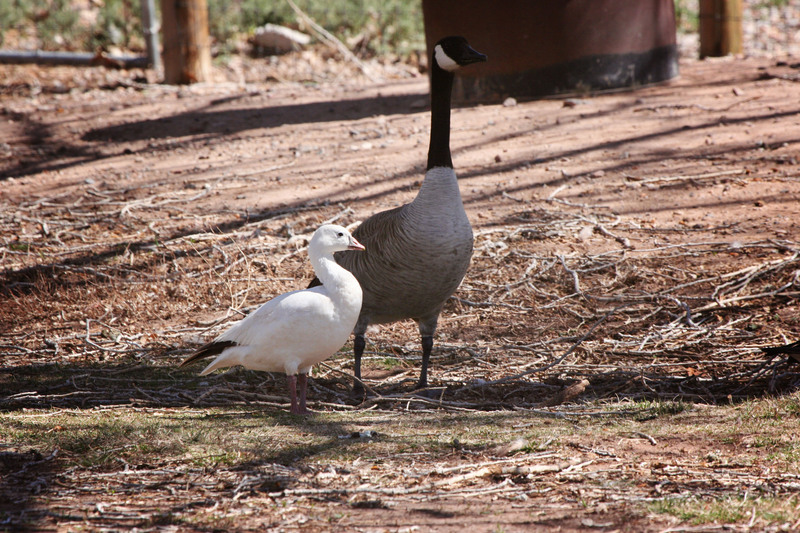 Looks that snow goose and Canada geese be friends. 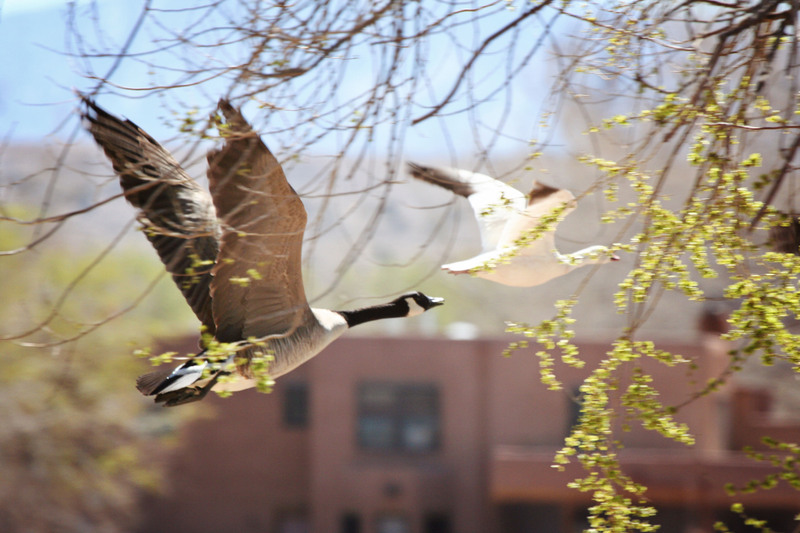 I love how the Canadian geese have taken her under their wings. And look at that grass starting to grow! Amazing in-flight photos. Bon voyage to the snow goose. I’ve never seen a snow goose before. I loved seeing the pictures of her (?) with her traveling partners. Great shots! I used to hunt geese and don’t remember there being such a size difference. Maybe you’ve got a bunch of Giant Canada geese on your place. I never knew there was such a thing until we shot one. Who knows. Awesome, you have very good observing eyes where you can catch unique shots to take from time to time. I recalled the day when you were on the ground crawling closer to,I think, the goat for better close up pictures couple years ago or so. Never cease at your performance as a photographer at home. 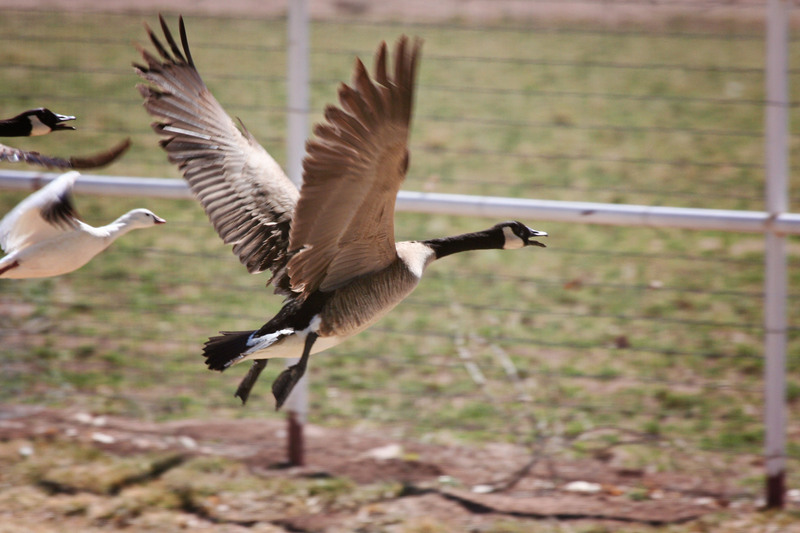 Great in flight photo you snapped. The snow geese size is shown very nicely in comparison to the Canada geese. I love it when you see whole “blizzards” in a field down your way. It actually looks like snow has not melted but this little one is late to the prom huh? We used to see mixed strings of Snow and Canada geese above the Arsenal. Very dramatic looking, especially on a bright lit blue sky sunny day! The Snow Geese just seem to glow!!! Amazing! Nature always surprises us! Thank you for sharing! Would it not be wonderful if humans could accept ‘outsiders’ in their mist in such a friendly way? Such a difference in size! Could that be a young Snow Goose? It’s nice to know that there isn’t any prejudice. Nice photos. How sweet and sad, all at the same time. We used to get whole fields covered with snow geese during migration where I used to live. Blizzard seems a very apt description. 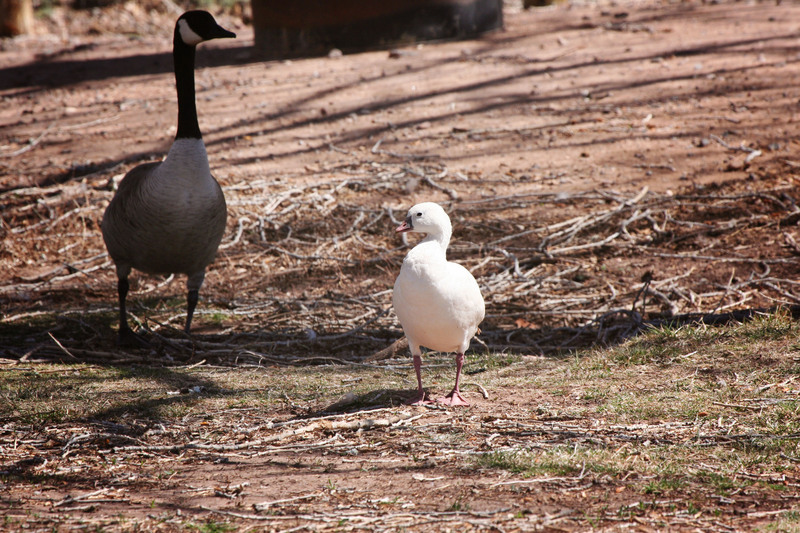 ahhh….. I’m a little sad for the snow goose who got left behind; maybe it will have a happy ending like “Home Alone”! I really enjoyed these photos, especially the ones in flight. Amazing that the Canada Geese accepted the other so willingly. The reason it looks so small is because it is a Ross’s Goose (Chen rossii), not a Snow Goose. That’s a good thing- Ross’s Geese are even rarer!